I'm going to start off by saying I am not a well-versed political analyst. But I can sense when changes on the world stage might have some serious implications for us here in America. The sounds and steady hum of discontent coming out of Europe have made me sit up and pay attention. It has drawn my focus away from our own problems and concerns, and thrown a spotlight on two events, in particular. 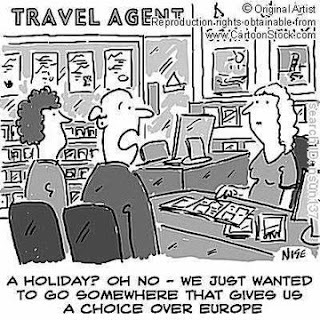 The elections this past weekend in France and Greece make it quite evident that austerity measures imposed to help get their economies back on track were highly unpopular with their citizens. The issues surrounding these elections are complicated and complex, but I think they could possibly foreshadow what may be coming our way. The unpopular austerity measures were largely imposed by the European Union and the International Monetary Fund, whereby countries contribute money to a pool through a quota system from which countries with payment imbalances can borrow funds on a temporary basis. The problem has become that an increasing number of member countries have failing economies, which results in more and more "borrowing" to meet their debt liabilities, resulting in higher taxes and cuts levied on fellow member countries. In simple terms, certain countries provide the financial resources while others use these resources. Both the EU and the IMF have pressured member nations to apply severe austerity measures, which have targeted development projects, welfare, and other social spending for cuts: Taxes, port and airport fees, train and bus fares are common sources of increased user fees. These cuts have resulted in protest movements throughout Europe, claiming significant declines in standards of living. Contributing factors to these protests are an ever-growing "entitlement" mentality among citizens, and immigration (both legal and illegal), which have swelled the welfare rolls. To add fuel to the fire, the IMF works closely with the World Bank, which is a lending institution, to maintain an orderly monetary system and exchange rate between members' currencies. With the spreading unpopularity of "Big Bankers", "Financial Systems" and Capitalism, in general, you can see that their proposed cutbacks are not met with open arms. By now, you are probably starting to get an idea that the elections in France and Greece were a ticking time-bomb. In Greece, workers and students demonstrated against cuts to pensions, public services and education spending as a result of government austerity measures. It is not pleasant to cut back and do with less, but it's the perfect example of the age-old problem of spending more than you take in. And of course, they always want to tax the rich; the 1% that they perceive have more than they need. Wealth redistribution is a common slogan among the "entitled". As a result of growing anger and the feelings that the government "owed them something", the Greek election fostered a new political party that could have ramifications world-wide. 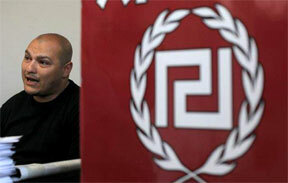 The leader of an extreme-right, anti-immigrant party lashed out at those he described as “traitors” responsible for the country’s financial crisis and said his party was ushering in a “revolution.” The far-right Golden Dawn party is projected to win 7 percent of the parliamentary vote, as Greeks punished the traditionally dominant parties who backed the despised and harsh austerity measures tied to debt-relief agreements. You might be asking, "7%? What's the big deal?" This party has seen an explosion in growth over the last few years, and it's popularity is on the rise. So why should we concern ourselves with what goes on in an election in Greece? Here's why: Golden Dawn campaigned hard against illegal immigration, and its supporters have been blamed for a recent spike in inner-city street attacks against mostly Asian immigrants. The party’s supporters, routinely seen intimidating dark-skinned immigrants in run-down parts of the capital, wear black shirts, and its emblems resemble Nazi insignia. But the party's leader, Nikolaos Michaloliakos, has rejected the neo-Nazi label widely used for his party, stressing that it is "staunchly nationalist". Hmmm, didn't a funny, little mustachioed man also adopt a nationalist platform in Germany, about 75 years ago? I don't know about you, but I see traces of our own Neo-Nazi youth, racial tensions, and Occupy sympathizers. In case you still haven't faced up to the facts, our own economy is teetering on the cliff, and I suspect the same feelings are fomenting under the surface of our "everything is alright" facade. 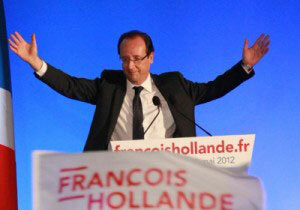 Meanwhile, in France, Francois Hollande stole the election away from Nicholas Sarkozy. Hollande, a Socialist/Communist, reflects a growing attraction to Socialism and a contempt for Capitalism. Hollande's victory promises a shift in emphasis away from austerity and deregulation, which pleases the French populace. So what does this shift look like? 1) Hollande could reshape the debate in the 17-nation eurozone. Until now, France and Germany — led by Sarkozy and Angela Merkel — have set the agenda on how best to restore troubled state finances and sluggish growth across the continent. The "Merkozy" solution: More cost-cutting to bring down debts and reassure markets. Hollande's solution: government-sponsored stimulus to revive growth. Sound familiar? 2) Hollande wants the very rich to pay 75 percent in income taxes and plans to hike taxes on companies that distribute profits to shareholders instead of investing in their business. Do I have your attention yet? 3) Sarkozy wanted to halve the number of legal immigrants who enter France each year to 100,000 and to tighten border controls. Hollande would give residency to illegal immigrants on a case-by-case basis. The immigration debate has gotten tangled with a debate about Islamic "customs" (code word for Sharia law) in strongly secular France, home to at least 5 million Muslims. So NOW do you see that these two elections could have an enormous impact on our own political landscape? If, as I contend, we are moving ever closer to a One-World Government, then these are huge red flags to me! I don't think it is coincidence that we are seeing these same sentiments being expressed throughout our political and social dialogue. But when does the "dialogue" become a "monologue?" When do we quit having a conversation among ourselves through a legitimate process, and start seeing directives and edicts? PLEASE, pay attention to what is happening in local, state and national politics! Now is the time to educate yourselves about who your candidates are and what they stand for. And I mean STUDY THEM! Don't vote based on a catchy political slogan, or an appealing ad. Do your research! Part of me says, "It won't do any good. We are already sailing off the cliff!" But there's another part that still believes there is a kernel of liberty and freedom in this country. Nearly 236 years ago, our forefathers made a decision to take a different path than Europe. Can we still see the faint traces of their footprints? Or have we let the weeds and garbage of time obscure the trail they marked out for us? I guess we will know in a few short months. Isaiah 8:11 "This is what the LORD says to me with his strong hand upon me, warning me not to follow the way of this people"